Start Shot Rock Vista on Highway 88, 0.8 mile east of Mormon Emigrant Trail and 3.4 miles west of Tragedy Spring. This tour is a longer version of the Shot Rock Loop tour and includes a descent into the Bear River canyon from which you must climb out. You will visit the same plateau as the shorter loop tour, from which the panoramas are breathtaking, but in the tour described here you will descend a slope from the plateau that affords an amazing opportunity to carve turns when the conditions are right. 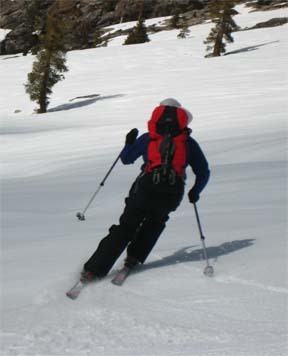 Like its sister tour, this tour takes you through some of the most amazing backcountry ski terrain and spectacular scenery on the Highway 88 corridor, and in fact in the Sierra. You will visit both Tragedy Creek and Bear River both of which are especially beautiful when they begin to open up in the spring and you are treated to water rushing down granite slabs and tumbling down cascades. From the plateau you will visit the views in all directions are astounding. 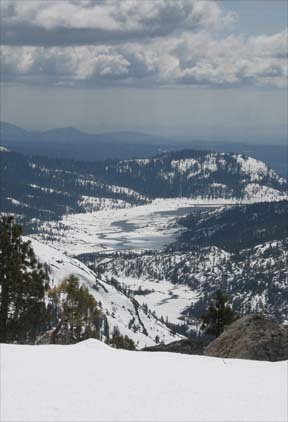 Most notable are Thunder Mountain, Timble Peak and Melissa Coray Peak to the northeast, Mokelumne Peak to the southeast, the Bear River drainage to the south, and Bear River and Lower Bear River reservoirs to the southwest. This tour and the Shot Rock Loop tour are just two of the many routes that can be skied in the area. Feel free to explore and be creative. The key to truly enjoying this area is knowing how to avoid the worst of the trees. Doing so requires that you begin with a 450-foot descent, which means that you are going to end the tour with a climb back up. But it's not too steep and well worth the effort. Finally a word of caution. In the spring take extra care when crossing Tragedy Creek and Bear River. From the trailhead (1) ski east on the snow-covered road for 0.1 mile until you reach Shot Rock Vista (2). A small building containing a toilet will likely be visible at the vista point. Descend the open slope slightly east of south for 0.6 mile until you reach a small creek (3). 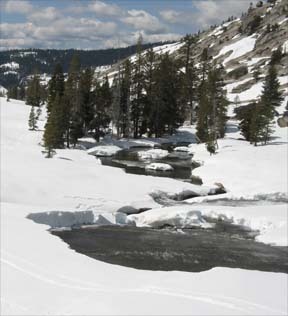 As you approach the creek you ski between two very small knobs before entering trees where the creek is located. This is the best location to cross the creek. Cross the creek, exit the trees near the creek and then ski in an arc to the northeast and then east for a total of 0.6 mile until you reach Tragedy Creek (4). Ski east and then southeast for a total of 1.5 miles until you reach a broad ridge (5). The best advice for route finding in this section is to climb gradually and stay above and to the west of a drainage as you ski southeast on the final approach to the ridge. You can shorten the tour by 1.5 miles by skiing west from here to mileage point 8 and then continuing on the described route. Descend south for 0.8 mile until you reach the Bear River (6). To really get a feeling for the Bear River — the granite walls that rise above it and the canyon as it descends — you need to explore the river canyon. It is 0.8 mile and -350 feet down the canyon to a point (6940 feet) where you get a noticeably better view of the canyon farther below (7). From where you first intersected the Bear River at mileage point 6, ascend northwest for 0.7 mile until you reach the edge of a plateau (8). 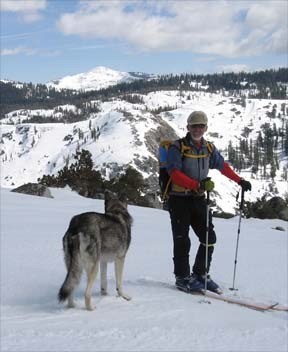 Ski southwest for 0.6 mile until you reach the southwest end of the plateau (9). From here you have a wonderful view of Bear River and Lower Bear River reservoirs. Descend the barren slope to the northwest for 0.5 mile until you reach the location where the gradient lessens and you see a passable route north (10). As you descend you should stay to the right of the trees that correspond to a minor drainage. This descent is often referred to as Rusty's Ridge. Local skiers, Chris and Dallas, named it in honor of their dog Rusty who was there constant companion for many years of skiing here. End of a great descent. Courtesy of D. Vaughn. Ski north for 0.4 mile until you reach Tragedy Creek (11). 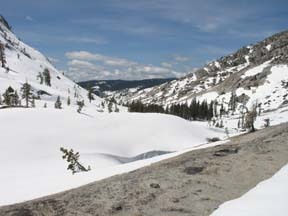 Ski north, passing to the east (right) of a small knob, for 0.5 mile until you reach the small creek (3) that you crossed at the beginning of the tour. Retrace the route for 0.7 mile back to the trailhead (1).